As science and technology progresses, a lot of medical practitioners start to look for other possible options for their patients than the conventional modalities. 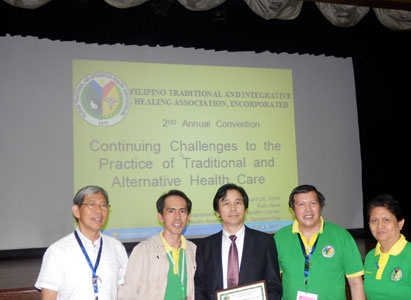 The Filipino Traditional and Integrative Healing Association, Inc., composed of many practitioners believing in the potential of Alternative Medicine, held their 2nd Annual Convention on “Continuing Challenges in the Practice of Traditional and Alternative Health Care” in OSHC this April 26, 2014 to discuss and spread their beliefs. 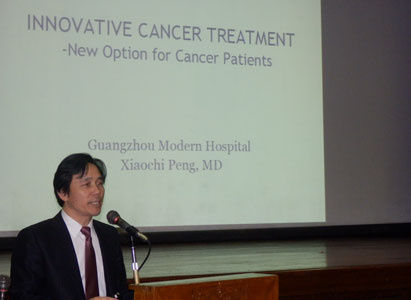 Among the invited guest speakers, the chief oncologist of Modern Cancer Hospital Guangzhou, Dr. Xiaochi Peng, actively participated in the events by sharing his expertise in cancer management using less invasive approaches. According to Dr. Peng, in additional to the conventional surgery, radiotherapy, and chemotherapy, there are many new modalities used in cancer management. These new modalities are less invasive which brings lesser trauma and side effects to the patients. 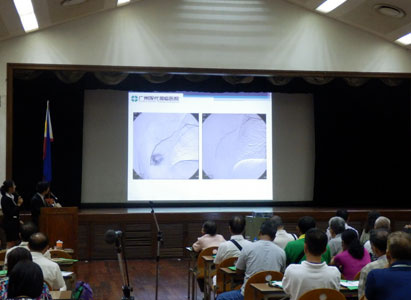 Among the 12 new modalities, Dr. Peng introduced to the audience some of the selected topics. Among them are the Intra-arterial Intervention, Cryoablation, I125 Seed Implant, Immunotherapy, and the most recent modalities of Photodynamic Therapy and Molecular Targeted Therapy. Photodynamic Therapy is an application of laser treatment where photo-sensitizers are infused into the patient’s body and spread all over. After 48 hours, these photo-sensitizers shall be excreted in normal areas and concentrate in the tumor lesions. Laser activator shall then be directed to the tumor area to kill the cancer cells. Molecular Targeted Therapy, on the other side, is applying principles of cell-biology, focusing on the molecular structure differences of cancer cells in comparison to the normal cells. Treatment will be targeted on the cells that have the features of cancer cells and spare the healthy cells. These treatments can be combined with other minimally invasive approaches to achieve the goal of curing certain type of cancers. 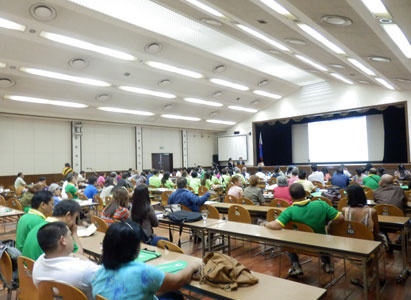 During the lecture proper, several case studies of patients of different cancer cases were presented and a lot of advanced stage patients such as Stage3-4 have even recovered. A lot of the new modalities can be a substitute for surgery, a highly preferred option for elderly patients that cannot undergo surgery or that have many complications such as diabetes and heart diseases. These statements not only earned a big round of applause from the audience but also give the patients and their family a sense of hope. With the continuous efforts of Modern Cancer Hospital Guangzhou, a lot more patients shall be given a chance to live a new life!